On Saturday, Countess Anna Theresa married Colin McKenzie in her Bavarian hometown. We already covered the wedding here. 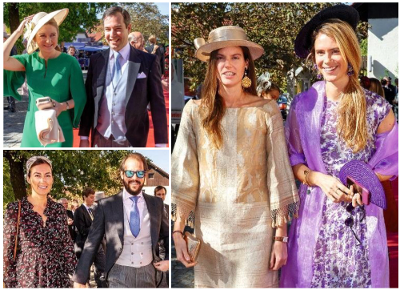 Thanks to a few new pictures which have surfaced in the printed media we can now give you a more complete rundown of which members of the Grand Ducal and Princely Families attended: In addition to the previously mentioned Grand Duchess Maria Teresa, Hereditary Grand Duke Guillaume and Hereditary Grand Duchess Stéphanie, Archduchess Marie-Christine and husband Count Rodolphe de Limburg-Stirum as well as Princess Margaretha and Prince Nikolaus with Prince Josef, we also spied Prince Félix and Princess Claire, Archduke Carl-Christian and Archduchess Marie-Astrid, Princess Nora as well as Princess Anunciata and Princess Astrid (in a special dress). The Hereditary Grand Duke, who appeared without a beard for the first time in years, was one of the witnesses at the wedding. On Monday, Hereditary Princess Sophie was supposed to attend an event on the occasion of European Depression Day. While there was info published in advance, we have not found any pictures or further reports yet. On Monday and Tuesday, Princess Margareta, Custodian of the Crown of Romania, and husband Prince Radu were on a semi-official visit to Liechtenstein (or whatever you call it when non-reigning royals visit reigning royals and make it look official). 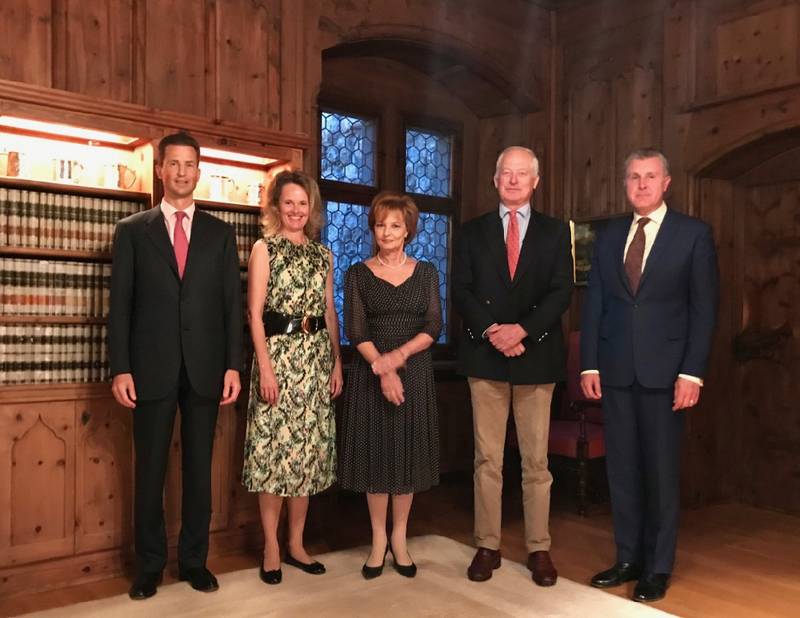 Princess Margareta, the daughter of Romania's last king, and her husband met with Fürst Hans-Adam II, Hereditary Prince Alois and Hereditary Princess Sophie as part of their visit. At least for part of their visit including visits to the Red Cross, a children's home and more, the Romanian royals were also accompanied by the Hereditary Princess. If my eyes don't deceive me, Princess Margareta and Prince Radu also ran into Princess Anunciata, oldest daughter of Prince Nikolaus and Princess Margaretha, fresh off her wedding adventures in Germany. 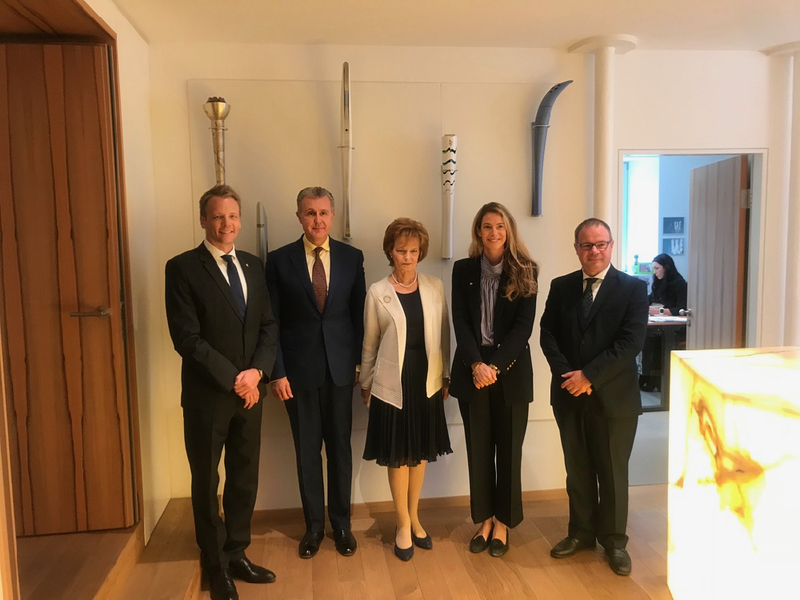 Princess Anunciata, who is a niece of Prince Hans-Adam, attended some meeting in relation to the Liechtenstein Olympic Committee probably standing in for her aunt Princess Nora. (News alert! Googling around I just found out that Princess Anunciata actually is a member of the Liechtenstein Olympic Committee since May, a bit of news we seem to have missed. All the details here.) 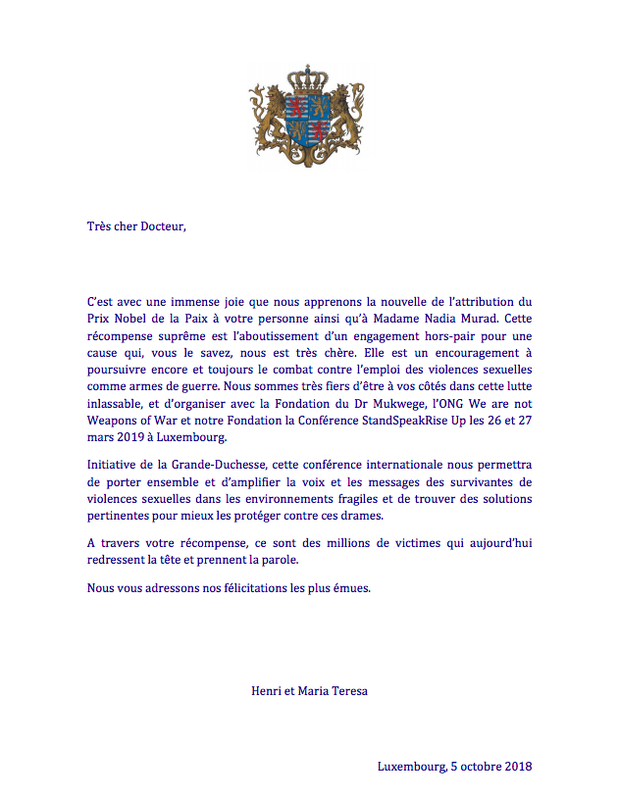 A lot more pictures (and information in case you can read Romanian) on the website of the Romanian Royal Family. Sometime midweek, either on Wednesday or Thursday, Hereditary Princess Sophie lend her support to the building project "The Roof" by attending the groundbreaking ceremony. In two years time, the new building will house the Liechtenstein Red Cross among others. More information and pictures at Volksblatt. Also earlier today, the Norwegian Nobel Committee announced this year's winners of the Nobel Peace Prize, Nadia Murad and Dr. Denis Mukwege, who were honoured for their efforts to end the use of sexual violence as a weapon of war and armed conflict. The Grand Duke and Grand Duchess sent letters congratulating both laureates. 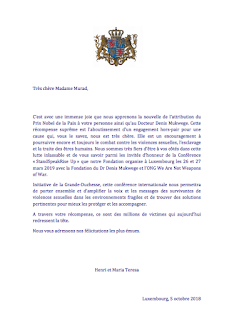 Grand Duchess Maria Teresa has met and worked with both Ms Murad and Dr. Mukwege. Together with the Dr. Denis Mukwege Foundation, the Fondation du Grand-Duc and de la Grand-Duchesse will host a conference titled "Stand Speak Rise Up" in Luxembourg next year. 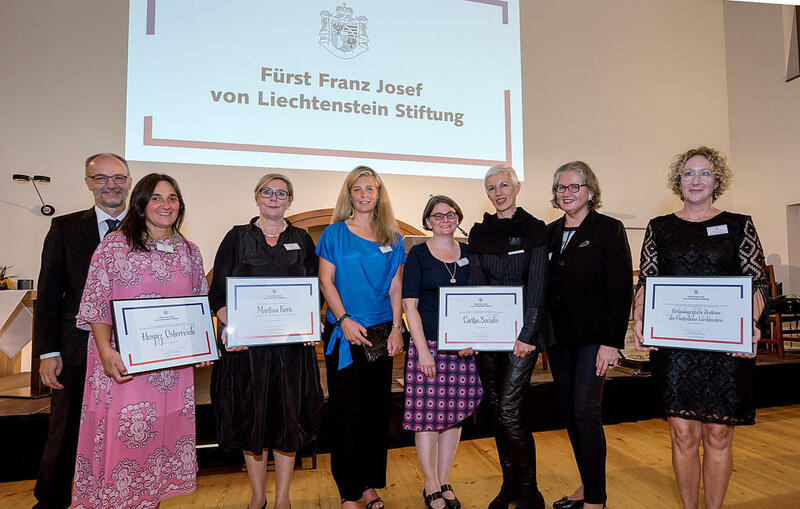 File the last one under the things we missed category: Back in mid-September, Princess Tatjana was out and about in Liechtenstein giving out the award of the Prince Franz Josef of Liechtenstein Foundation honouring three associations working in the field of palliative care. The only daughter of of Fürst Hans-Adam, is the president of the foundation named in her grandfather's honour. More pictures at Vaterland.